I just received word that my employer Delta Airlines, has announced that our 12,500+ pilots will be issued the 10.5 “ iPad Pro to replace the MS Surface Tablets we currently use. You may have heard this already, but I figured I’d let you know in case you hadn’t. Beginning early 2018, Delta will equip its more than 23,000 flight attendants and 14,000 pilots with Apple iPhones and Apple iPad Pros, respectively, as the airline transitions to its next generation of flight crew devices. The iPhone 7 Plus will replace existing Nokia Lumia 1520 phablets, which flight attendants first began using in 2014, as an in-flight point of sale and onboard customer service tool. The new iOS device will continue to feature the Guest Service Tool which allows flight attendants to provide more personalized service and recognize high-value customers on each flight. Flight attendants can also provide customers with the status of down-line flights and connecting gate information. The device also brings Delta in line with its Joint Venture partners at Aeromexico, Air France, KLM and Virgin Atlantic. For Delta's pilots, Apple's iPad Pro will replace the Surface tablets that have been used in the flight deck as an electronic flight bag since 2014. With the transition, Delta will join many other airlines, including key global partners, in leveraging the iOS platform to provide a high degree of synergy and cooperation in the continued development and enhancement of aviation applications. Similar to the current device, the new iPad Pro tablets will feature Delta's suite of tools for pilots including the Jeppesen Flight Deck Pro for flight planning, the latest version of Delta's turbulence app — Flight Weather Viewer Plus, and a content library containing detailed aircraft and procedural manuals. 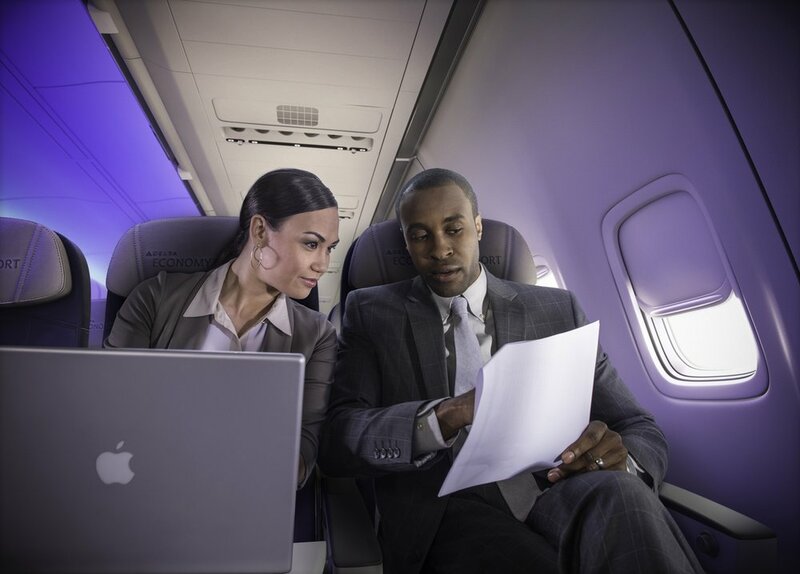 The airline continues to maintain a strong and positive partnership with Microsoft, and some of the applications used on the iPhone 7 Plus aimed at enhancing customer and employee engagement are powered by Microsoft Dynamics. Delta will begin jointly rolling out the iPads to pilots and iPhones to flight attendants early next year. The strangest part about all of this is that it does not seem to have turned up anywhere online. Still - got it unbidden from two separate individuals. Since neither of them asked me to keep it under my hat - in fact one assumed I'd have heard by the time the message got to me, here it is. Also - wanna do a bit of fun PR-cheology? Delta's page of trademarks and slogans is kind of interesting. I understand ditching 1929's slogan, "Speed, Comfort and Safety." Who wants to be reminded that anything about their travel might not be safe? So in the early 1930s, they changed their slogan to "Speed, Comfort and Convenience." "So... we're giving up safety then?"